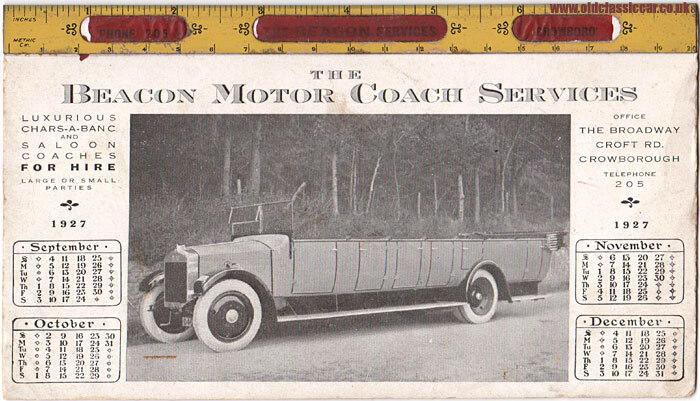 Beacon Motor Coach Services in 1927. Homepage. This page: An illustrated calendar featuring a vintage char-a-banc, dating to the late 1920s. Fred dropped me a line, after he'd landed on the pages in the archive that feature photographs of vintage charabancs on them. He was also kind enough to scan and send over this image of a fabulous calendar he has in his collection. It was issued by Beacon Motor Coach Services in 1926/1927, and features a substantial char-a-banc, fitted with white tyres and no permanent headlamps. The Beacon Motor Coach Services head office was situated in Crowborough, and a photo of their early premises can be seen on this Crowborough & District site (external link). Their fleet included "Luxurious chars-a-banc" (not char-a-bancs! ), and saloon coaches. More items relating to motoring in the olden days, including details of various motor coach operators operating in the UK, may be found in the Motoring Collectables section.